Stop by the Blue Pub in Methven for great food, drinks, entertainment and accommodation right in the centre of town. You can’t miss the appropriately-named Blue Pub—it’s the brightest building in town. The lovely old structure features a wide verandah, the perfect spot to pass a warm afternoon, and single, twin and super king rooms upstairs. 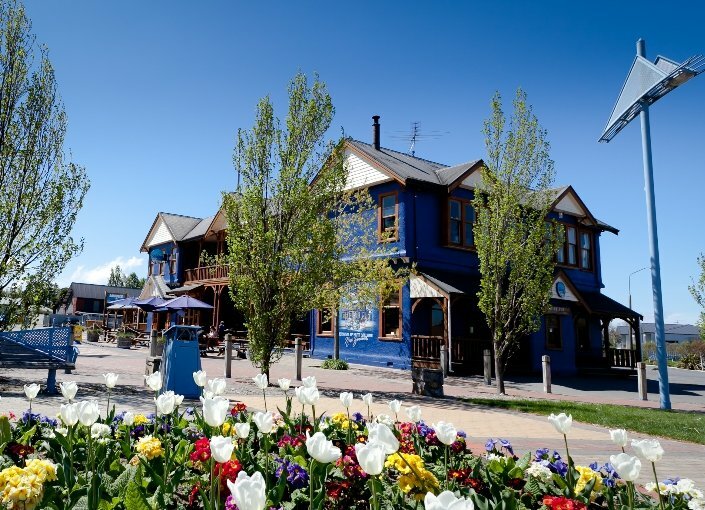 Whether you are basing yourself in Methven for a week of skiing at Mt Hutt, mt biking at the Bike Park or if you’re just passing though, the Blue Pub is a worthwhile stop. The menu at the Blue Restaurant is varied, and sure to please anyone. The menu features typical pub fare like seasoned wedges and burgers, to filling main courses like lamb shanks and Akaroa salmon. Kids 10 and under eat for free as well! Live music is also part of the Blue Pub experience, the main bar being one of Canterbury’s best live music venues. Check out the gig guide online to see what’s going on during your visit.